Each match lasts for 80 minutes plus time added to account for injuries and stoppages during the game. A match consists of two halves of 40 minutes each. It is controlled by a single referee on the firld of play, two assistant referees (touch judges), and in professional matches, a match official called the video referee who can use television replays to rule on a particular incident. The object of the entire game is that each team scores as many points as possible. The team with the greater number of points when time is over wins the match. Points are scored by either scoring a try or a goal. A try is only scored when the player takes the ball across the goal line and grounds the ball. Grounding happens when the ball is on the ground and the player’s hand is on the ball. This ‘try’ is worth 5 points. a conversion (awarded after a try is scored) by either a drop kick or a place kick. 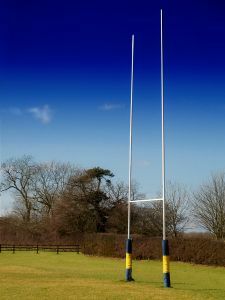 A penalty or dropped goal is worth 3 points; a conversion is worth 2 points. The pitch must have 100 meters or less between the goalposts and an in-goal area behind each post. The length of the in-goal must be between 10 meters 22 meters. The pitch must be less than or equal to 70 meters wide. The goal posts are ‘H’ shaped and are placed in the middle of the goal line. The two uprights are placed exactly 5.6 metres apart and the crossbar that links them is 3 meters above the ground. The team currently with the ball (called ‘having possession’) moves the ball up the field toward his opponent’s goal line or to try for a dropped goal. These are the only two ways a team can score in ‘open play’. try or goal is scored. The team in possession may choose to advance by kicking the ball forward. The ball may be passed from one player’s hand to another as long as the ball does not travel forwards in the pass. Rugby union is one of the few ball games where the ball cannot be passed forwards. Any player who is part of the attacking team must be behind the ball to take an active part in the game. A player taking up a position between the ball carrier and the opposition goal is offside and may not join the game or interfere with play. The defending team who wants to take possession will tackle the ball carrier to stop him and make him release the ball. A tackle consists of grabbing hold of the opposing player and bringing them to ground. A tackled player must either pass or release the ball otherwise a foul is called. Releasing the ball allows the opposition to contest possession of the loose ball in open play. Play continues like this until a rule is broken or the ball goes out of play. If the ball goes into touch it is thrown back into play. This may be taken quickly from one player to a member of his own team. More usual is the ‘line-out‘; here, both teams line up in equal numbers, one metre apart and contest a ball thrown between them. In the case of a place such as a penalty kick the ball can sit in a small plastic cradle or pile of sand. From open play, the player drops the ball to the ground and kicks it – this takes skill and timing. A successful kick at goal is worth three points. The most prized and most valuable scoring method is a ‘try’ attained by grounding the ball in the in-goal area behind the goal line. This is worth five points. The conversion kick is taken from a point between the two sets of posts directly in line with where the ball touched the ground for the try. The ball may be any distance away from the posts as long as it is along that line.